As an ecommerce business owner, you already know there’s a ton of activities you should be doing to keep your products flowing out the door and money flowing in. Maybe you’ve dabbled in social media as a way to make that happen. -But social’s grown a lot since the days of cans and strings (hello MySpace). In fact, social media marketing has the potential to be one of the best marketing opportunities you’ll find. Social media networks are expected to have over 2.5 billion users by the end of 2018. That’s almost 3 billion: you can’t afford to ignore it. It’s time to get real about social media marketing, or SMM, as we marketers call it. Free feedback – your followers, fans and customers are happy to get on Twitter or Facebook and shout to the world how happy (or unhappy) they are with a product or your services. Bonus: You don’t have to pay them for it. Free press – if you’ve done a good job with representing your company, your customers will share it. Woot woot! However, pay close attention, because the same goes for negative press. Free marketing research – people are so happy to share their thoughts. Send out a question, “What do you think about xyz?” If you’re active on your social accounts, you’ll get quick responses. This kind of marketing can’t be beat. To position your ecommerce business for the coming social media marketing boom there are a few things you should be doing right now. Social media platforms offer some of the most sophisticated ad programs around. With Facebook, you can filter out to an almost absurd level. You can use the typical demographics like age, income, education, and location, but you can also find people who like a specific Facebook page or who have purchased a particular item in the past 30 days. And the reporting that you receive from these platforms is as detailed as you could want. It is easy to determine your ROI and also which ads are performing the best. Going forward, we expect to see a significant amount of successful businesses moving larger portions of their advertising dollars to social media. Social media is a perfect vehicle for content distribution. You can easily create specific content for a certain market segment and get it in front of them at just the right time. Customers are more likely to buy from a business that provides them with personalized content. Consumers will gladly supply personal information (name, email address, etc.) in exchange for content that they find valuable. Create content that answers questions and solves problems, and you will be handsomely rewarded. Customers want to engage with brands via social media. This is a fact that too many businesses ignore. The average Internet user spends approximately 1 hour and 40 minutes browsing social media sites. That presents a lot of opportunities to build relationships. Create automated searches for your company name and find out what people are saying about you. Answer their questions, provide assistance, share their content; you know…be social. You should be posting high-quality content on all of your social media accounts on a daily basis. If you are not already doing so, you should consider producing video content. It is the easiest for consumers to digest and provides the strongest branding opportunities. Video content generates more website traffic than other types of content. This fact alone should inspire you to break out the video camera and get to filming, but if you need more of a push, make sure you read 37 Staggering Video Marketing Statistics for 2017 over at WordStream. If those statistics don’t get you jumping for a camera, nothing will. Social media offers your business a unique opportunity to provide real time customer service to your clients. By staying on top of what your customers are saying about you, you can quickly deal with any problems that may arise. And you can do it in a very public arena. When potential customers see how you handle displeased current customers, they’ll begin to trust you. They can see you will do all you can, within reason, to make the situation right. Make social media an extension of your customer service department. 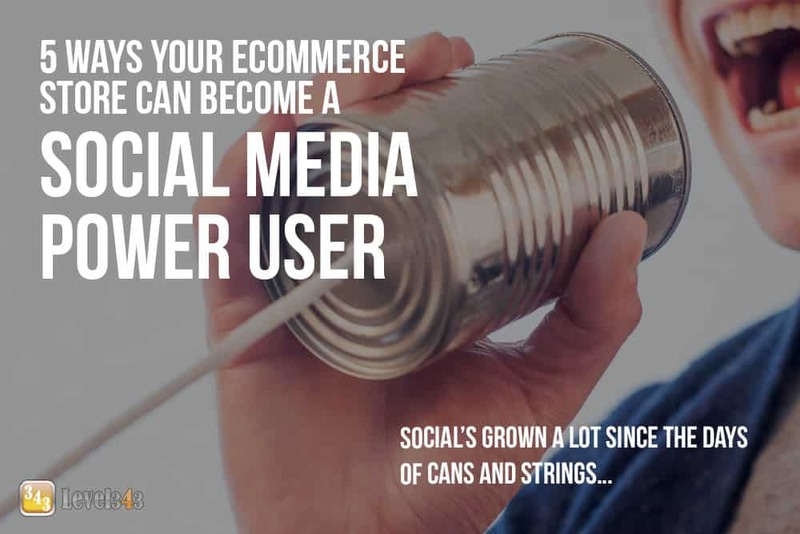 The long and the short of it, as they say, the whole of it all, is that social media marketing has a high possibility of helping your ecommerce business grow in leaps and bounds. By following these five tips, you can easily build the reputation, and bottom line, of your ecommerce store and dominate your industry. If you need help with your social media marketing, contact Level343. We’ve been marketing to social networks since… well, since there were social networks. Let our experience work for you.